Monday 5 November 2018, Benefit dinner for “la parole aux Migrants” by All Included http://www.allincluded.nl/. Volkseten Vegazulu, 7pm. From 9pm, live music on the stage with The Flamenco Thief. 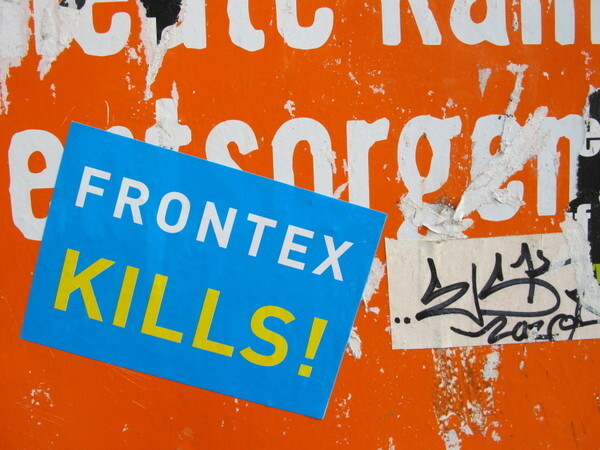 While the European Union is putting pressure on North and sub-Saharan Africa to close their borders, we see no genuine initiatives working on the reasons why migrants are leaving their countries. From 5-7 dec. 2018 the World Forum on Migration and Development takes place in Marrakesh. 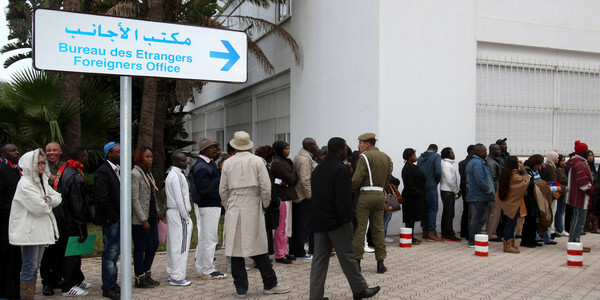 Five years ago Morocco started developing a national migration policy including an asylum procedure. In the last 50 years Morocco changed first from a migration country to a transit country and now a country of destination. What is the impact of this policy on the lives of the migrants? The Association of Refugees and Migrant Communities in Morocco (ARCOM) and the Platform of Subsaharian Associations and Communities in Morocco (PASCOMS) organize a big meeting inviting Moroccan NGO’s in a migrant neighborhood in Rabat while giving the voice to the migrants. Doors open at 19pm with food. Screening and discussion from 20:30. On that screening, David Fedele will be also on-line after the screening to discuss the film with Kumut and the audience. 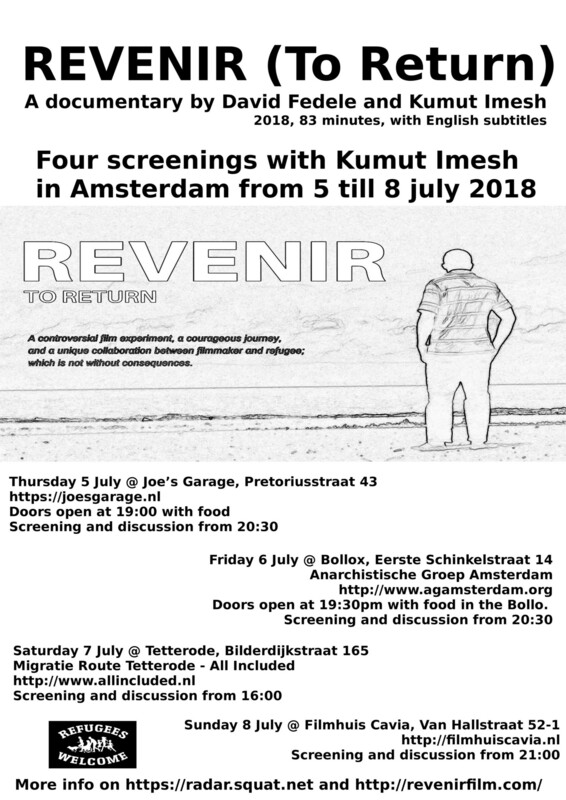 David Fedele‘s latest film Revenir is a collaboration with Kumut Imesh from the Ivory Coast in West Africa, who now lives in France as a refugee. The film follows Kumut as he returns to the African continent to attempt to retrace and film the same journey that he himself took more than ten years ago, when forced to flee his country to seek asylum… But this time with a camera in his hand. Kumut Imesh – co-director / camera / protagonist : Originally from the Ivory Coast in West Africa, Kumut was forced to flee civil war in his country in 2004. Seeking a peaceful and safe place to live, he began the long journey across the African continent before finally arriving in Morocco, where he spent 7 years. While in Morocco he worked closely with NGOs and associations working closely with other migrants, providing support and assistance. In 2013 he met the film director David Fedele in Morocco, and he worked as the translator for the film The Land Between. During this time, Kumut developed a very keen interest in documentary film-making, especially the potential to tell stories from an African perspective, and the original idea to make a film retracing his journey across Africa was born. In 2014 Kumut arrived in Europe, and was granted asylum. He currently lives as a refugee with his wife and small child in France, working as a webmaster. He is also the founder and president of ACSORE (Actions of Solidarity for Refugees), an association in France that works for the social and educational integration of asylum seekers and refugees. REVENIR is Kumut’s first film. David Fedele is an independent documentary filmmaker, traveler, wanderer, dreamer, musician, part-time philosopher and full-time incessant thinker. He entered the world of documentary filmmaking through a love of travel and exploring different cultures, having traveled extensively throughout Australasia, Europe, the Middle East, Africa and South America. Generally working alone, self-producing and self-funding his own projects, David is particularly interested in exploring cultural, humanitarian, environmental and social justice issues. His films have covered such diverse topics as sub-Saharan African migration in Morocco, electronic waste in Ghana and illegal logging in Papua New Guinea. In 2014, David Fedele screened The Land Between in various locations in Amsterdam. 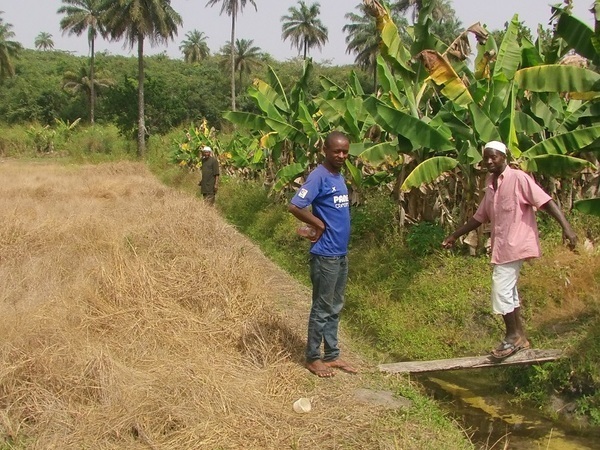 REVENIR – synopsis: For years, the stories of West African migrants and refugees have been told through the lenses of foreign journalists. Now there is a story from the inside. Thursday May 24th 2018, Benefit Freedom of Movement, Volkseten Vegazulu, 7pm. After the food and talk from All Included http://www.allincluded.nl/, around 9pm, music with Farbrengen, acoustic klezmer duo from New Orleans with Rebecca Mac (violin) and Mattias Kauffman (accordion). All Included is a small campaign organization in Amsterdam that struggles for free migration and sustainable development. We support the migrants’ movement that fights for their rights. Monday March 12th 2018, Benefit Freedom of Movement, Volkseten Vegazulu, 7pm. All Included http://www.allincluded.nl/ is a small campaign organization in Amsterdam that struggles for free migration and sustainable development. We support the migrants’ movement that fights for their rights. Monday January 15th 2018, Benefit dinner for All Included, Volkseten Vegazulu, 7pm. All Included is involved in Afrique-Europe Interact, a partnership between African and European grassroots organizations that support free migration and sustainable development. Contacts are mainly in Western Europe (Mali, Togo, Burkina Faso, Senegal) and North Africa (Morocco, Tunisia). Themes are deportation, freedom of movement, land grabbing, corruption. All Included is also active in Watch the Med http://www.watchthemed.net/) and Alarm Phone (http://alarmphone.org/en/), a 24-hour emergency phone for those who cross the Mediterranean. Undocumented migrants in Amsterdam are where possible supported by All Included. Monday September 11th 2017, Benefit Freedom of Movement All Included & puppet show with the Enormous Face, Volkseten Vegazulu at 7pm. From 9pm, puppet show on the stage! Kalan Sherrard aka Enormous Face, “Nothing Matters”, Avant-Garde Nihilist Subway Performer, located these last years in New York City is back in Europe. Kalan will be performing at Joe’s Garage his “non-narrative nihilist anarchist puppet show about literary theory” made of “things out of garbage and dead animals. Volkseten Vegazulu is a people’s kitchen, every monday and thursday, all year long. Door opens at 7pm. Vegan food for 4€ or donation. All benefits go for social & political struggles. No reservation. In July and August, the people’s kitchen is closed on thursday.